Human Emotions shape us. They shape us professionally and personally. They also have a stronger influence on our overall performance and satisfaction with life than we care to realize. 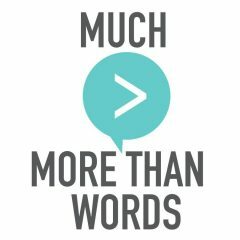 In talking with participants of a Much More Than Words workshop we ran back in the Autumn, I was reminded of how strongly I too felt when working overseas about ‘not being who I thought I was’. What I mean by that is that in another country and not being as able to express myself as well as I might in my own language, I somehow felt ‘less’ and undoubtedly lost out, as did the company in different ways. It was if I had lost part of my identity because I had mentally defined myself by what I did, rather than who I was. I felt as if someone was going to tap me on the shoulder and whisper ‘Psst… what are you doing here’ and that I was an imposter somehow because by the time I opened my mouth to say something, to contribute in team meetings, all too often the conversations moved on before I had a chance.The problem was not that I lacked the ability to speak in French, but I lacked the confidence to just say what I meant and not worry about speaking perfectly. I believe it was this lack of confidence in my early working life that led to emotions getting the better of me and working in the world of advertising, I needed to brave up fast, which I did but paid the price, a story or two for another day. But I learnt plenty from those early years. 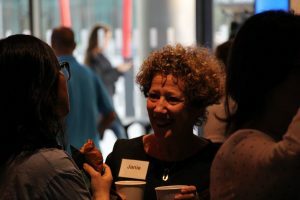 That our experiences and emotions do indeed shape us and as my career progressed, I had a responsibility to those who worked in my teams to make sure how I handled situations didn’t have a detrimental impact like some of my earlier experiences had on me. Whether you are working and speaking in your own language or another, self confidence is key to performance. The first Dublin breakfast event for 2017 – Contact Janie on 087 8572005 or click on image to book your place. Had I been a stronger, more resilient person and not so self conscious perhaps my ‘strangeness’, my identity as the girl from London could have been used to my advantage, as ‘a wild card’ and I would have played it stronger. But my emotions won and got the better of me. In the workplace, how we see ourselves and others see us impact hugely on our ability to perform. How we are treated by our peers and those who lead the organisations we find ourselves in impact in ways previously considered less important perhaps than they are today. Dr. Annette Clancy from the Quinn School of Business in UCD will be sharing invaluable insights on the 18th January, at the first of our Breakfast Events for 2017 to be held at the Bank of Ireland Enterprise Centre, Montrose, Dublin. If you’re involved in HR or a leadership role and can make it, I feel sure this will be time well spent. If you’d like to know more, you can call me directly on 086 8572005.
simply click here to book your place. Our 2017 Breakfast Series begins on the 18th January with Dr. Annette Clancy, Assistant Professor of Organisational Behaviour at UCD College of Business. She’ll share invaluable insights and open up the conversation with HR Specialists attending. If you can, join us for lively discussion around what we believe really matters. At a time when technology is fast replacing the need for human intervention, never has the importance of respecting the true value and potential of ‘our ‘human capital’ been more crucial along with the need for human connection..
Janie Lazar and Andrea Goldman of Much More Than Words hope you can make this early morning meeting. Space is limited, booking advisable. 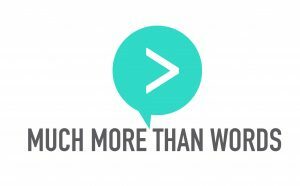 ‘Much More than Words’ focus on boosting communication skills in the Workplace – especially in organisations with a multi-cultural workforce. Having worked overseas, we know what it’s like to be competent, fluent even in another language and yet, not confident enough to fully engage and integrate effectively. Helping all employees through our integrated training approach to get up to speed faster and maximizes their true value and potential. To discuss your specific Training Needs, contact Janie Lazar on 086 8572005 or click here to email. 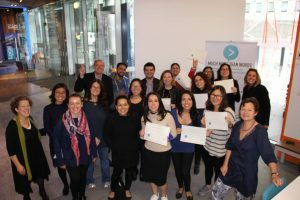 This workshop saw participants really connecting, taking the opportunity to present with conviction, making use of the useful appropriate business English they had learnt and with great confidence.We had the most fantastic group, with people from Syria, Korea, Poland, Venezuela, China, Italy and Spain – the bank was buzzing ! And what did we learn as Facilitators?! Just how important it is for non native English speakers to be supported by their Employers to help them integrate, engage and contribute even more so their skills can be fully maximised and potential realised. Building language skills with both competency and confidence means employees and and their companies benefit as overall communication skills become even stronger. Our integrated approach in training leads to greater loyalty, greater work/life satisfaction and has a positive effect on company performance and profitability. A WIN/WIN all round.